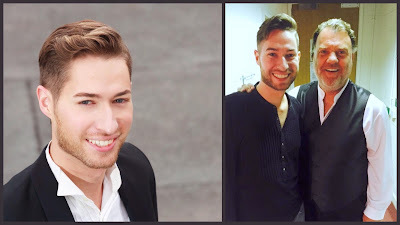 A reader in the UK has introduced us to Lithuanian barihunk Romanas Kudriašovas, who is a Young Artist at the London National Opera Studio. On November 28th, he'll be performing scenes from the Mozart/Da Ponte operas as part of the National Opera Studio residency at Opera North. The concert will be at the Howard Assembly Room at 7:30 PM. On December 10th, he joins the great British soprano Susan Bullock for a candle-lit celebration of English song in St. Giles Cripplegate Church in London. The program will feature music from Vaughn Williams, Gurney, Quilter and Britten. Tickets are available online. Romanas Kudriašovas and Giedrė Muralytė-Eriksonė perform Donaudy's "O del mio amato ben"
Romanas began his music studies at age seven playing the violin and piano. After initially studying choral conducting, he went on to study voice at the Music and Theater Academy in Lithuania Hochschule für Musik und Theater in Hamburg and the Wales International Academy of Voice, where he received his Masters. He has performed music ranging from the Baroque to the 20th century repertoire, including: Elviro in Handel's Serse, Antenor in Rameau's Dardanus, Valens in Handel's Theodora, Mr. X in Kalman's Zirkusprinzessin, Bill in Kurt Weill's Aufstieg und Fall der Stadt Mahagonny, Lockit in Britten's The Beggar’s Opera and the Sacristan in Puccini's Tosca opposite Bryn Terfel’s Scarpia. Kudriašovas is fluent in English, German, Lithuanian and Russian. Support the arts with one of these calendars. Our 2016 Barihunks calendar will fund a new non-profit to support young artists, commission new music and provide a vocal competition prize for baritone/bass voices. The Marco Vassalli calendar will help fund his US debut in San Francisco performing two songs to German texts from composer Clint Borzoni. Click HERE to order the 2016 Barihunks Charity Calendar! Click HERE to enjoy 12 months of barihunk Marco Vassalli and support his US debut!